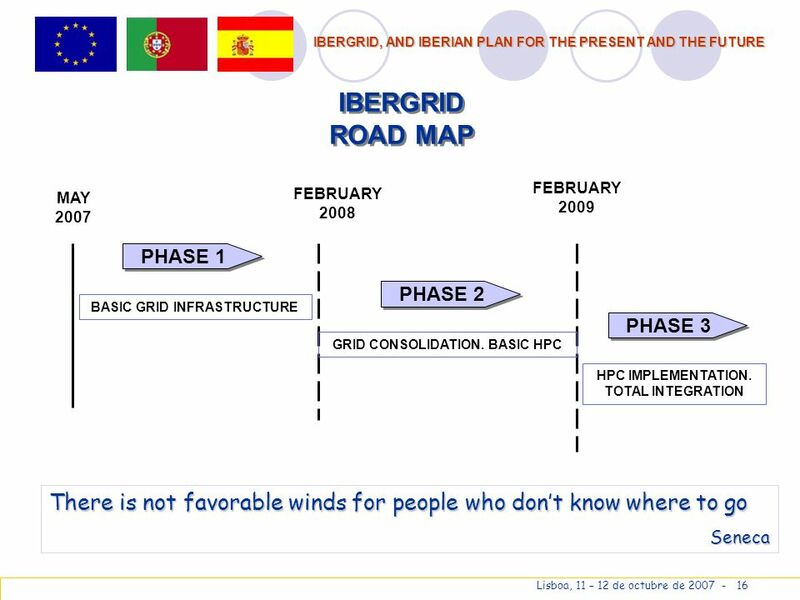 IBERGRID, AND IBERIAN PLAN FOR THE PRESENT AND THE FUTURE Lisboa, 11 – 12 de octubre de 2007. 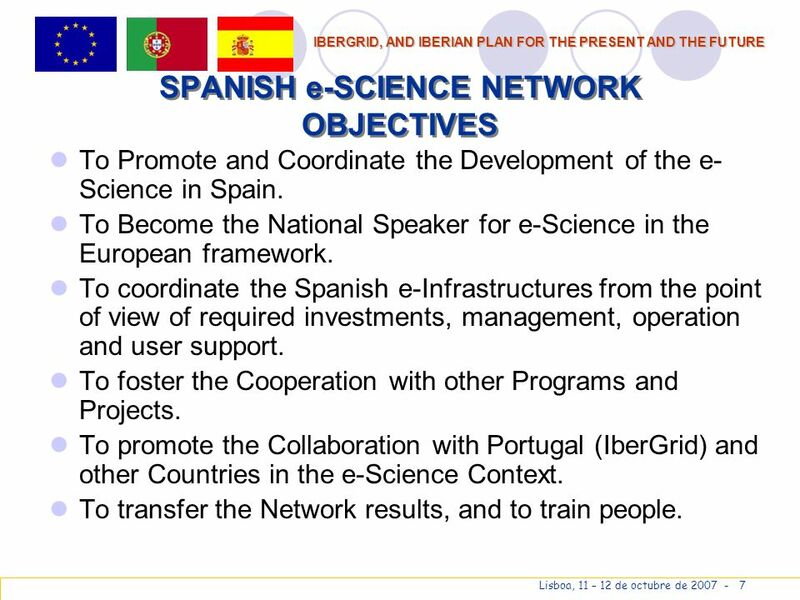 7 IBERGRID, AND IBERIAN PLAN FOR THE PRESENT AND THE FUTURE Lisboa, 11 – 12 de octubre de 2007 - 7 SPANISH e-SCIENCE NETWORK OBJECTIVES To Promote and Coordinate the Development of the e- Science in Spain. 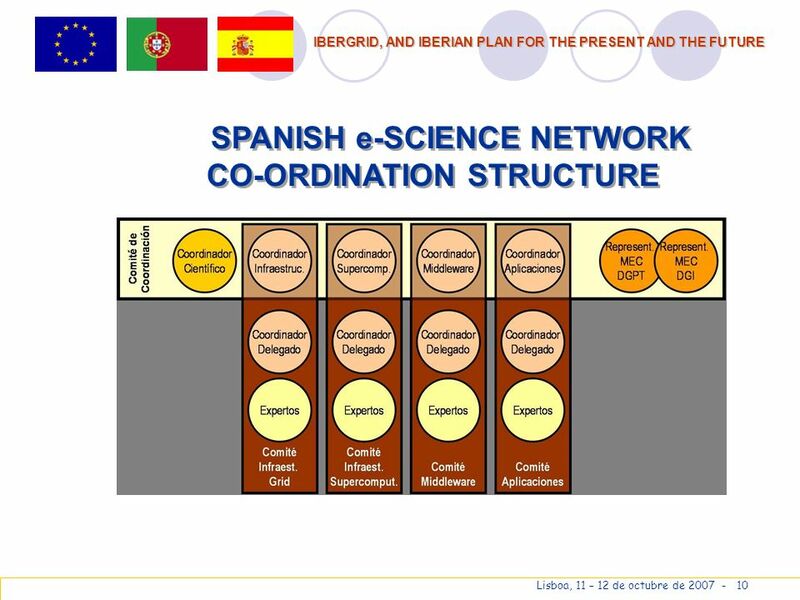 To Become the National Speaker for e-Science in the European framework. 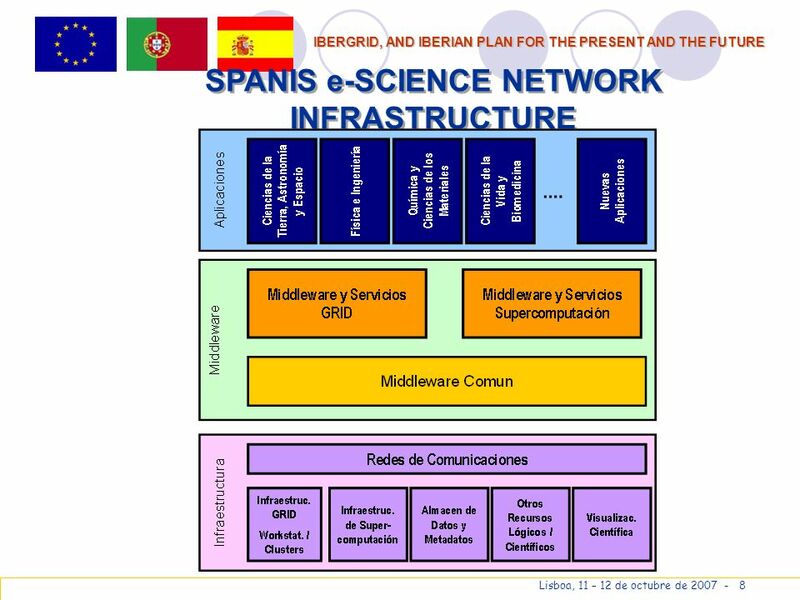 To coordinate the Spanish e-Infrastructures from the point of view of required investments, management, operation and user support. 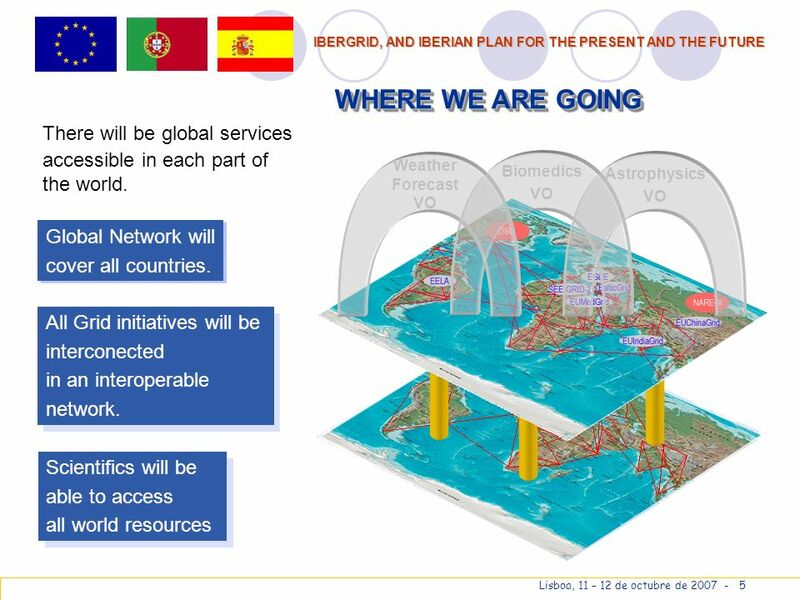 To foster the Cooperation with other Programs and Projects. 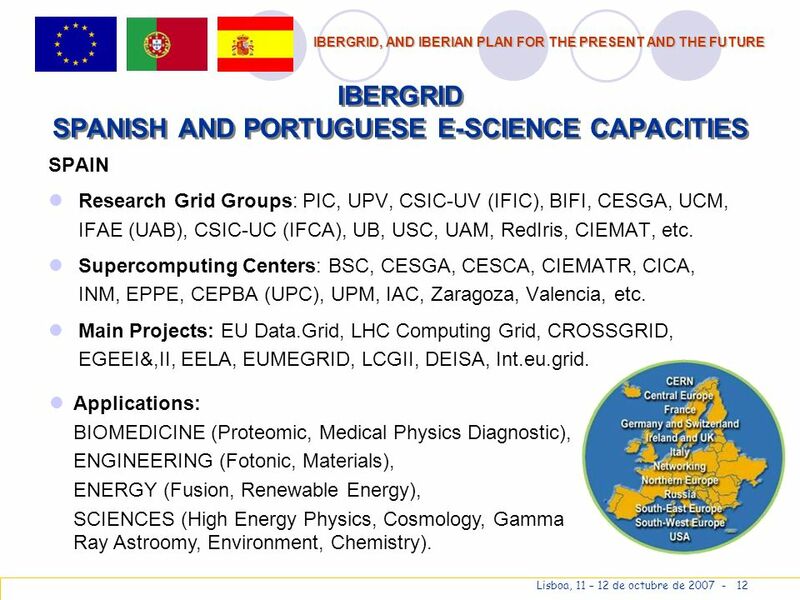 To promote the Collaboration with Portugal (IberGrid) and other Countries in the e-Science Context. 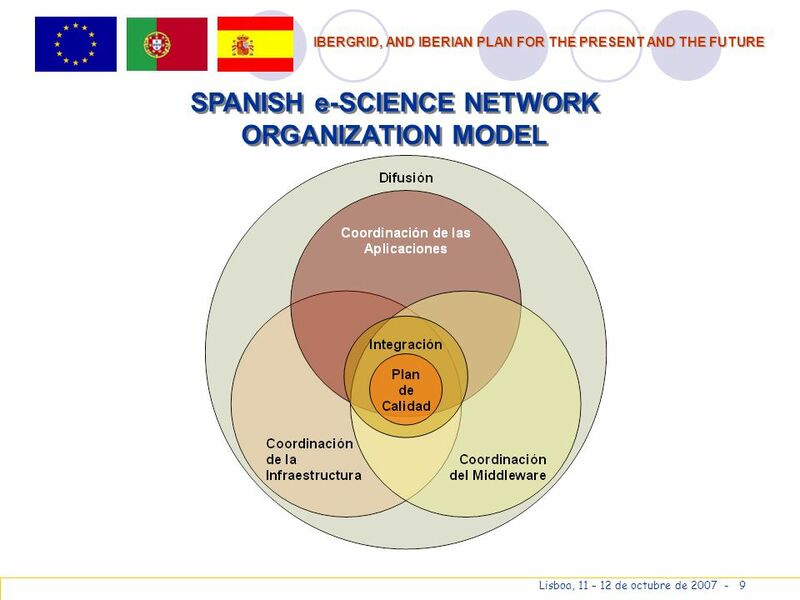 To transfer the Network results, and to train people. 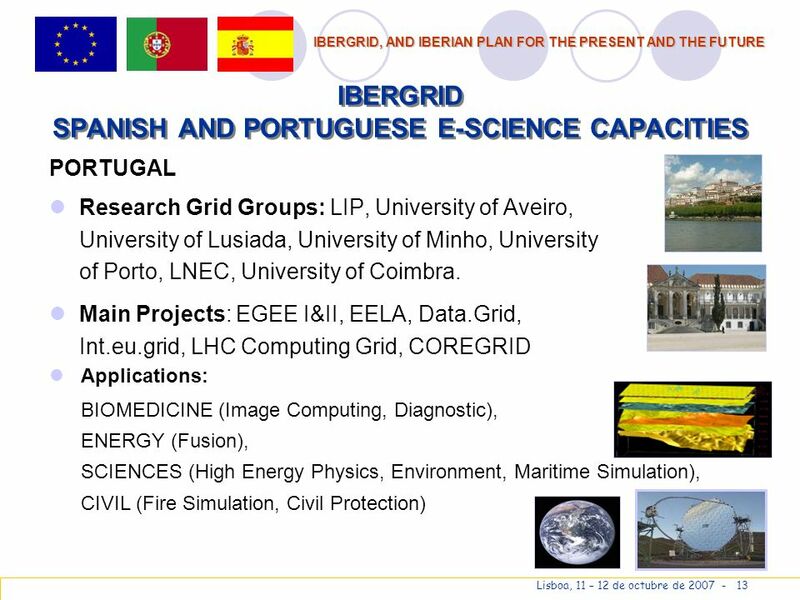 12 IBERGRID, AND IBERIAN PLAN FOR THE PRESENT AND THE FUTURE Lisboa, 11 – 12 de octubre de 2007 - 12 IBERGRID SPANISH AND PORTUGUESE E-SCIENCE CAPACITIES SPAIN Research Grid Groups: PIC, UPV, CSIC-UV (IFIC), BIFI, CESGA, UCM, IFAE (UAB), CSIC-UC (IFCA), UB, USC, UAM, RedIris, CIEMAT, etc. 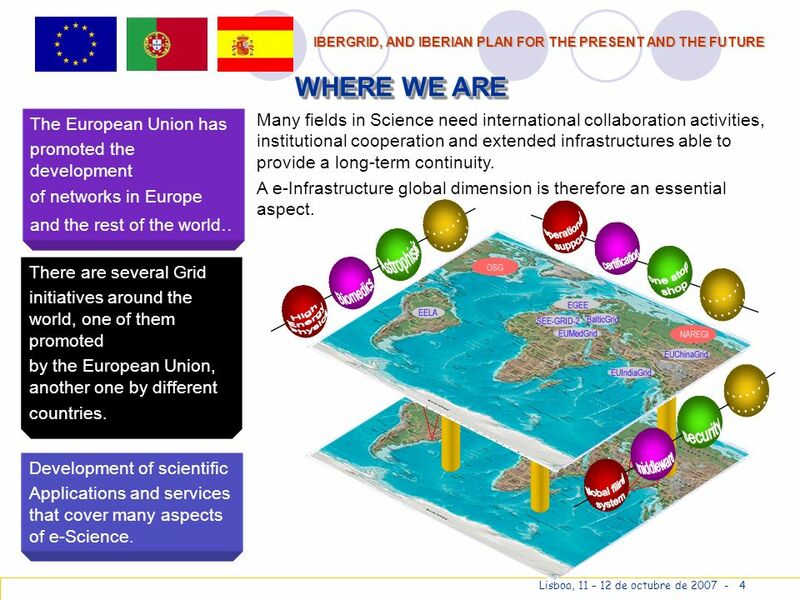 Supercomputing Centers: BSC, CESGA, CESCA, CIEMATR, CICA, INM, EPPE, CEPBA (UPC), UPM, IAC, Zaragoza, Valencia, etc. 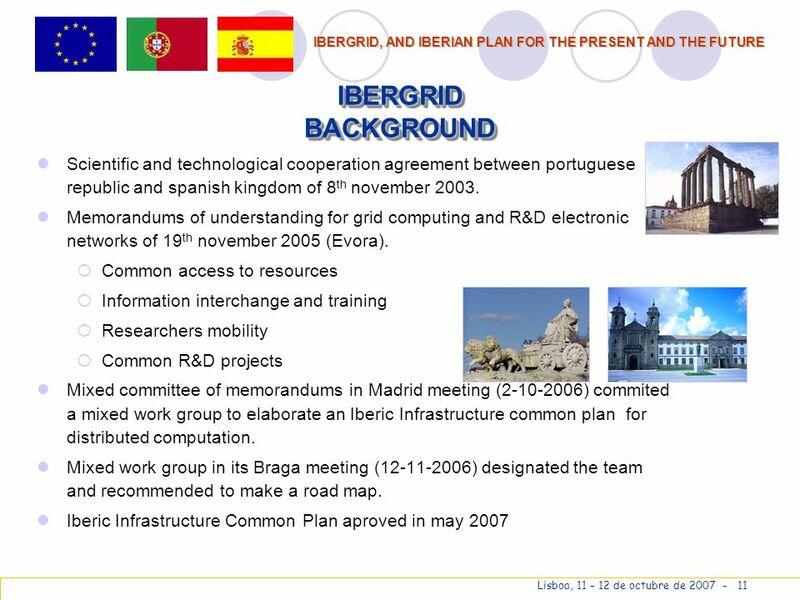 Main Projects: EU Data.Grid, LHC Computing Grid, CROSSGRID, EGEEI&,II, EELA, EUMEGRID, LCGII, DEISA, Int.eu.grid. 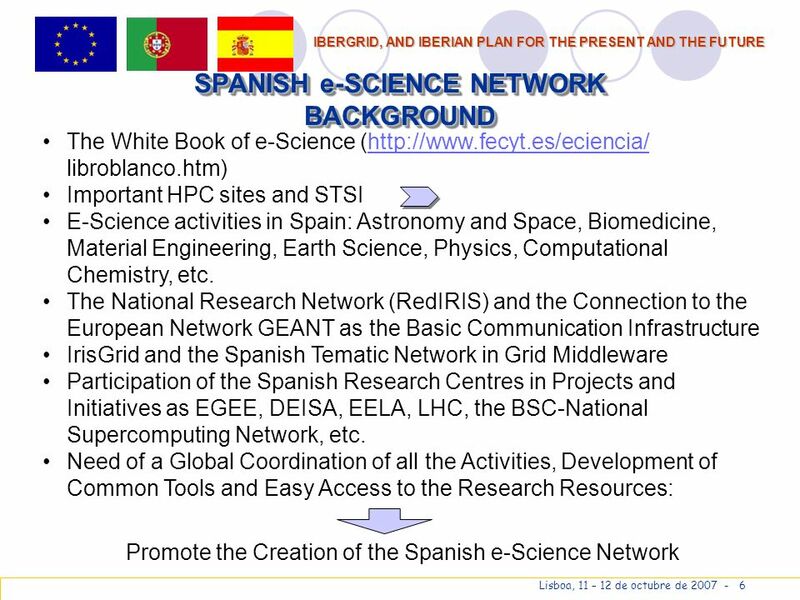 Applications: BIOMEDICINE (Proteomic, Medical Physics Diagnostic), ENGINEERING (Fotonic, Materials), ENERGY (Fusion, Renewable Energy), SCIENCES (High Energy Physics, Cosmology, Gamma Ray Astroomy, Environment, Chemistry). 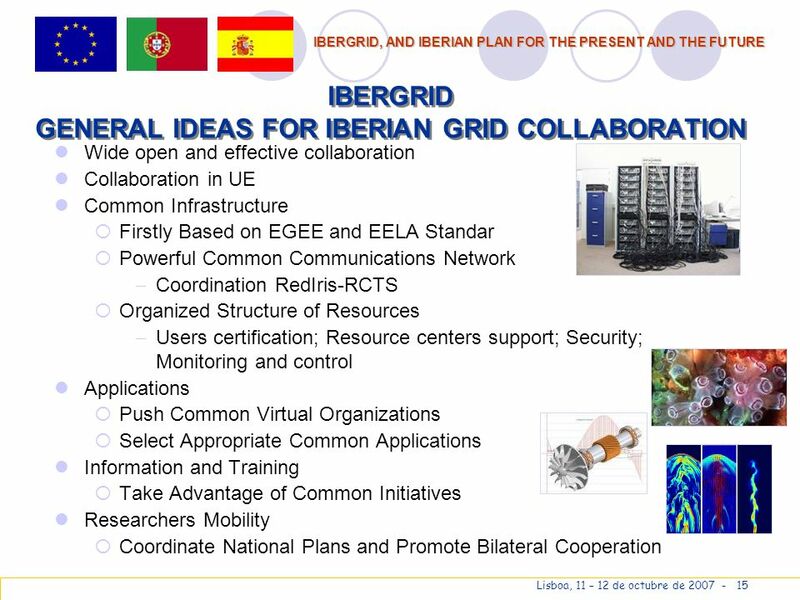 14 IBERGRID, AND IBERIAN PLAN FOR THE PRESENT AND THE FUTURE Lisboa, 11 – 12 de octubre de 2007 - 14 IBERGRID COLLABORATION BETWEEN SPAIN AND PORTUGAL EGEE. 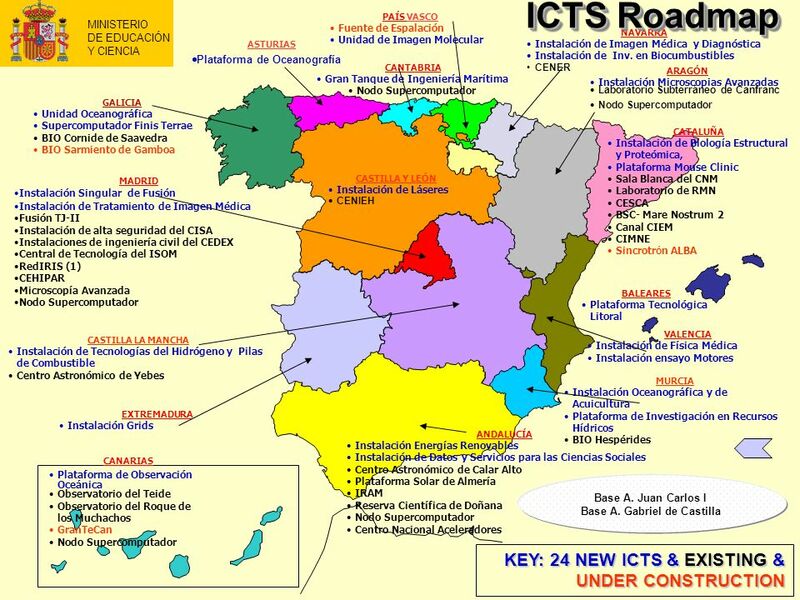 14 Centers in southwest federation. 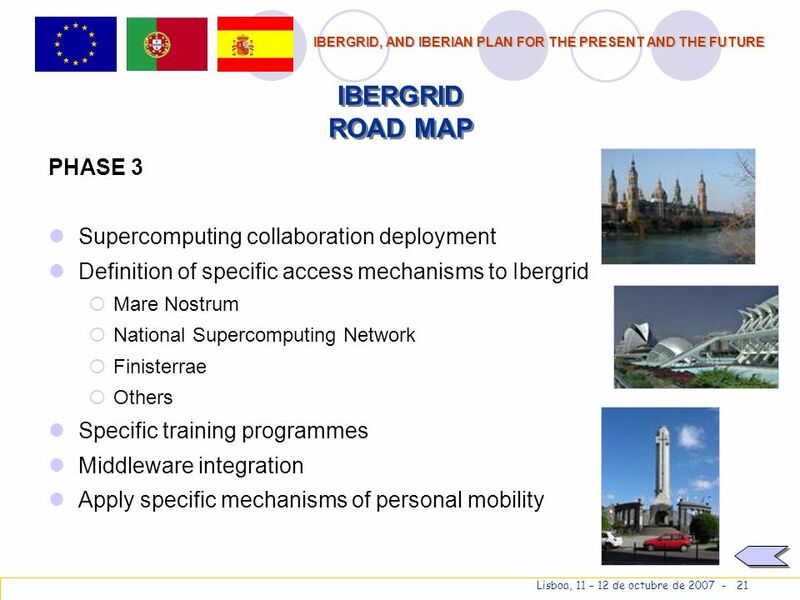 Collaboration in SA1 (Infrastructure), SA3 (Middleware Certification), NA2, NA3 (Disemination and Training) and NA4 (Aplications). WLCG. 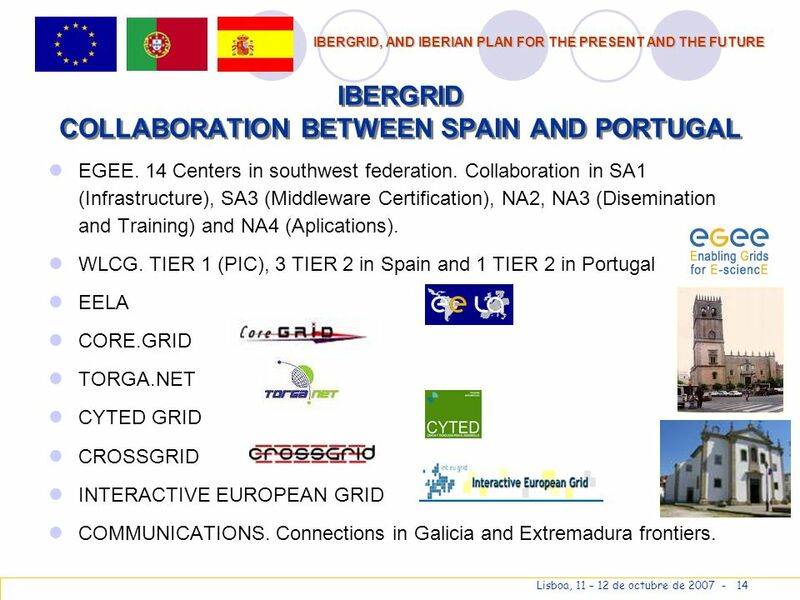 TIER 1 (PIC), 3 TIER 2 in Spain and 1 TIER 2 in Portugal EELA CORE.GRID TORGA.NET CYTED GRID CROSSGRID INTERACTIVE EUROPEAN GRID COMMUNICATIONS. 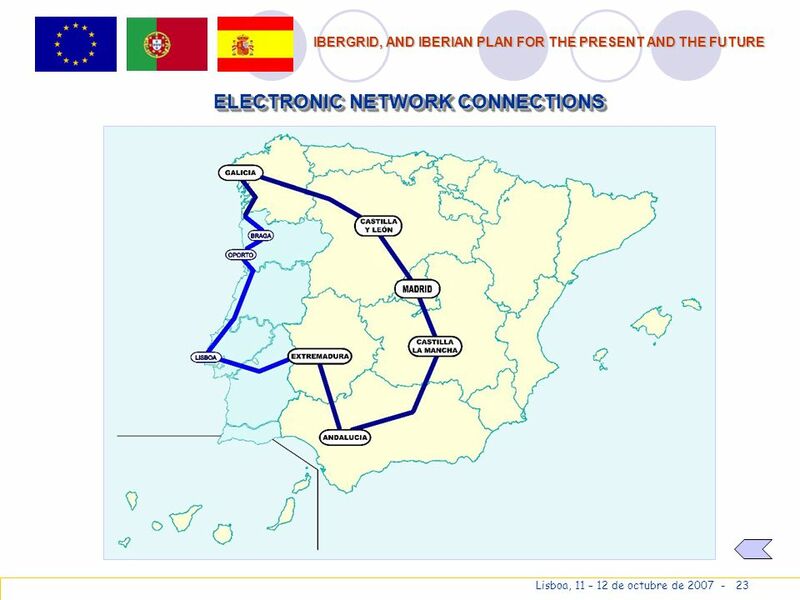 Connections in Galicia and Extremadura frontiers. 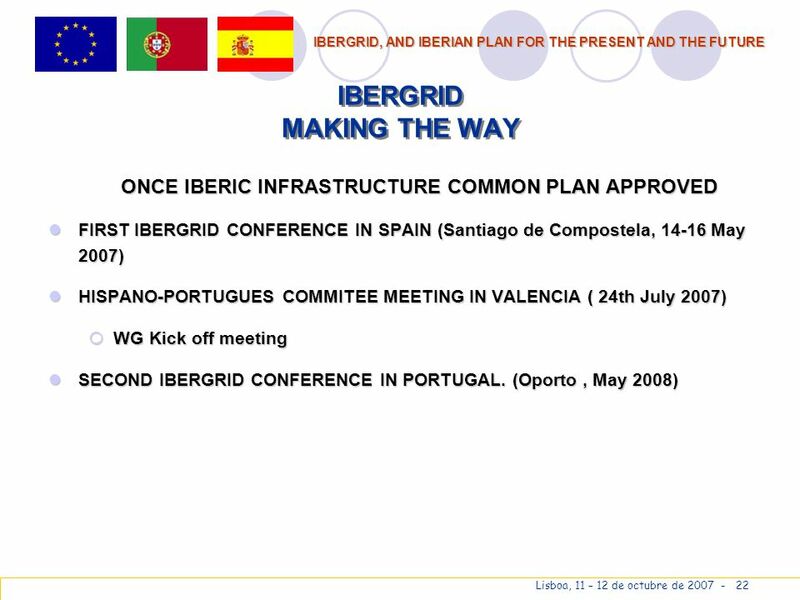 19 IBERGRID, AND IBERIAN PLAN FOR THE PRESENT AND THE FUTURE Lisboa, 11 – 12 de octubre de 2007 - 19 IBERGRID ROAD MAP PHASE 1 ( 9 MONTHS) Communication network connection trough Galicia and Extremadura. Organization approval and deployement. 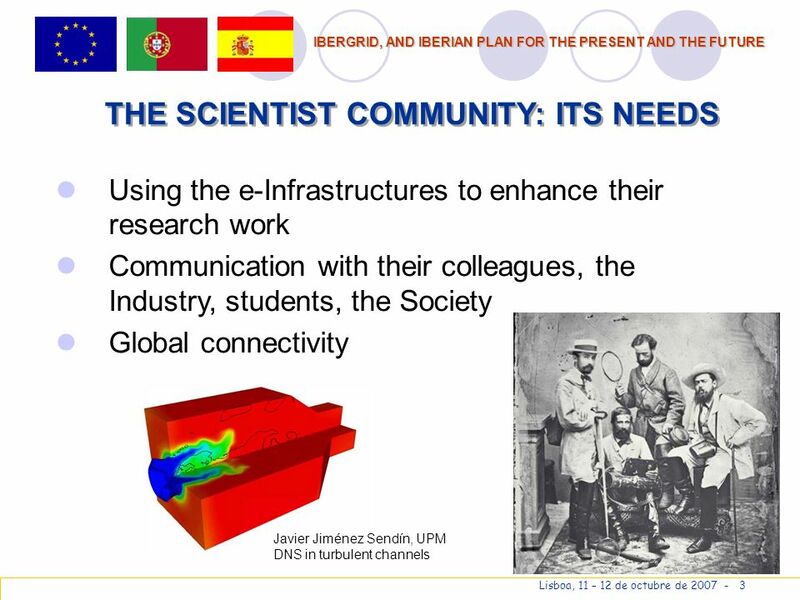 Starting with present infrastructures (glite). Identification of COIs and resources inventory. Definitions of resource centers characteristics. Resources access standars and procedures. 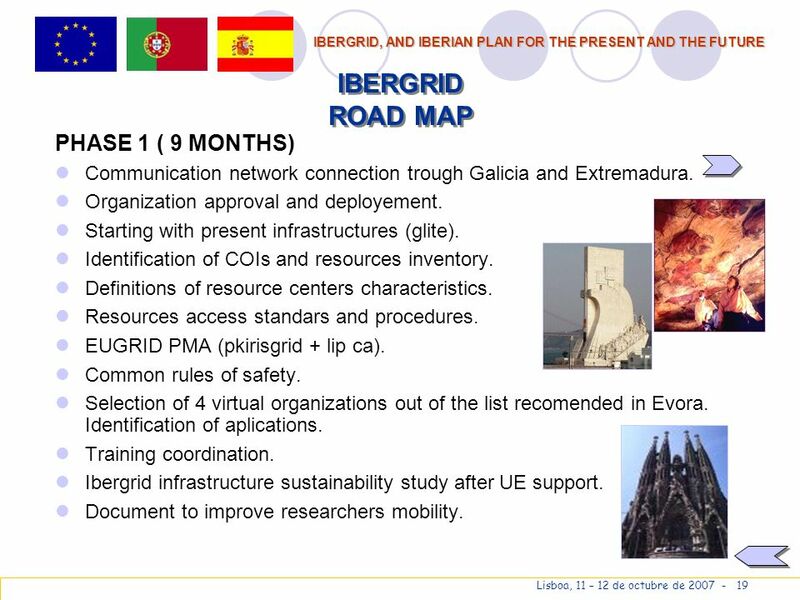 EUGRID PMA (pkirisgrid + lip ca). Common rules of safety. 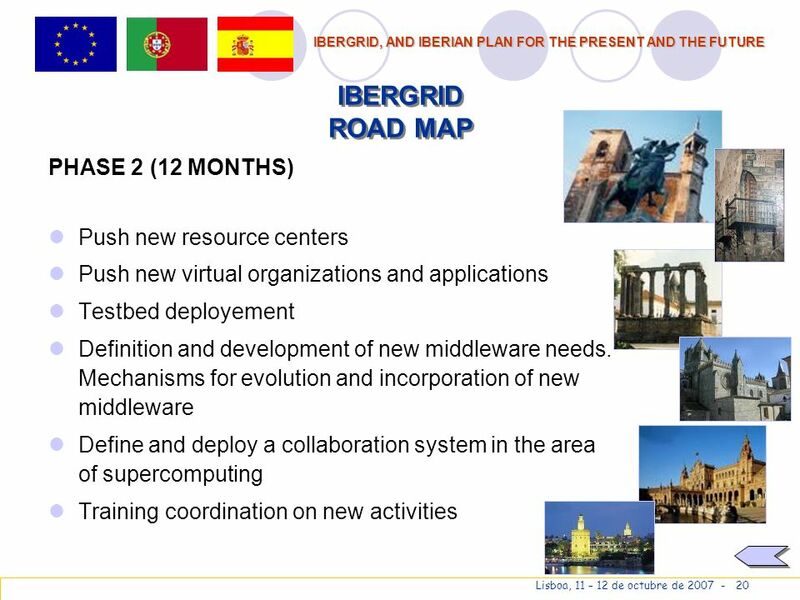 Selection of 4 virtual organizations out of the list recomended in Evora. Identification of aplications. Training coordination. 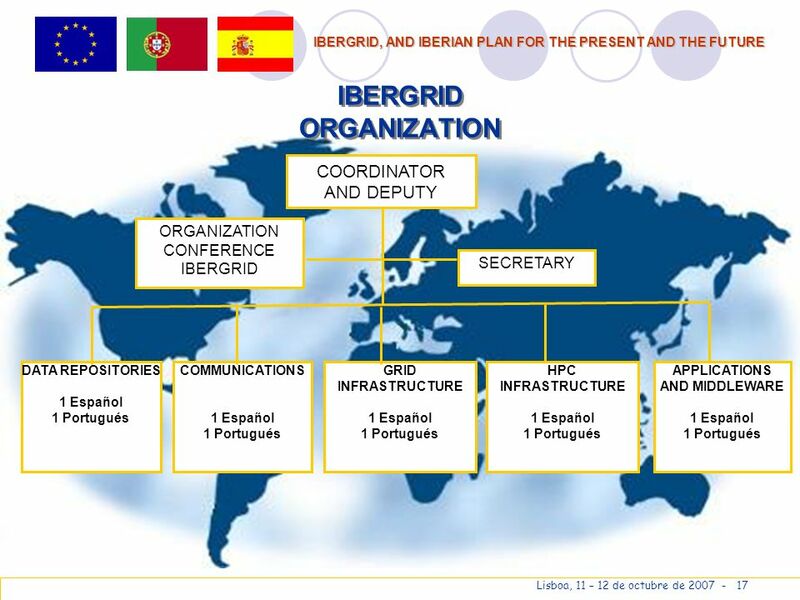 Ibergrid infrastructure sustainability study after UE support. 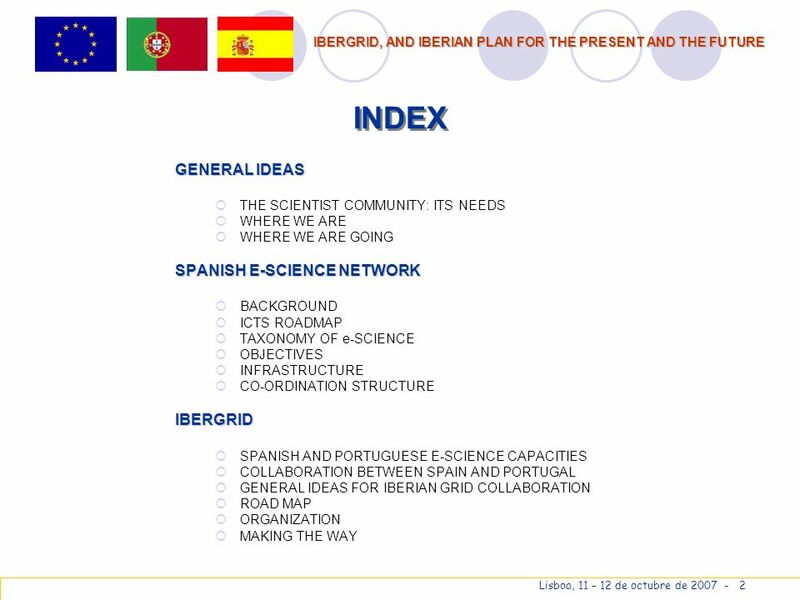 Document to improve researchers mobility. 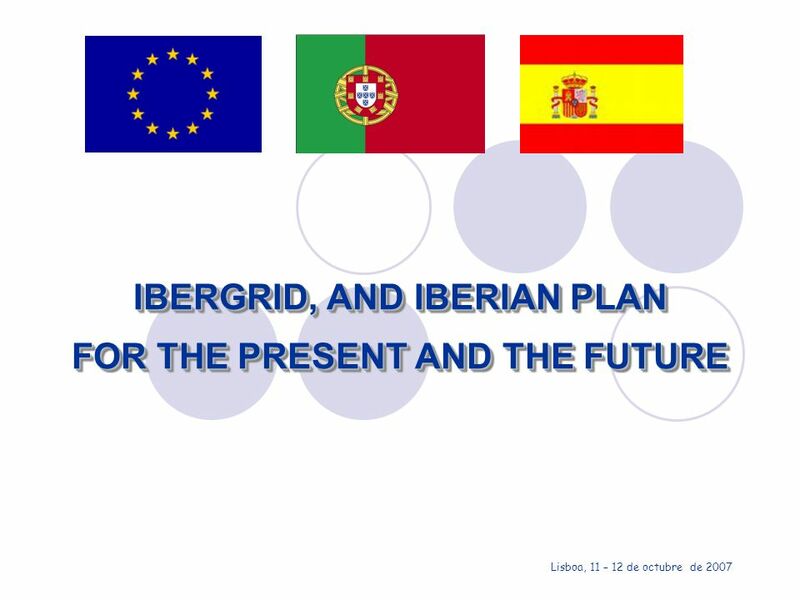 Descargar ppt "IBERGRID, AND IBERIAN PLAN FOR THE PRESENT AND THE FUTURE Lisboa, 11 – 12 de octubre de 2007." Education Leaders Briefing Personalizing Learning at Scale Mr. Juan Jose de Mora Minister of Education Veracruz State, Mexico. Learning Achievement in Creativity and Design Subjects according to Professional Profiles (2006) European Transfer Credit System (ECTS) Methodology in. Invertir en el futuro de los jóvenes a través del sector cultural y creativo. Investing in the future of the young people across the cultural and creative. Parent Leadership in Education & Youth Education Tekies Centro Sor Juana in Las Milpas South Pharr, Texas. 1 Dr. Alberto Pérez Gómez Deputy Director of RedIRIS Entidad pública empresarial Red.es TF-MSP Meeting Paris, RENATER Offices, RedIRIS The Emergency. Paola De Castro, Daniela Marsili, Elisabetta Poltronieri Istituto Superiore di Sanità – Italia Paola De Castro, Daniela Marsili, Elisabetta Poltronieri. PRESENTACIÓN REUNIÓN PREPARATORIA IX REUNIÓN DE MINISTROS DE JUSTICIA O DE MINISTROS O PROCURADORES GENERALES DE LAS AMÉRICAS, REMJA. 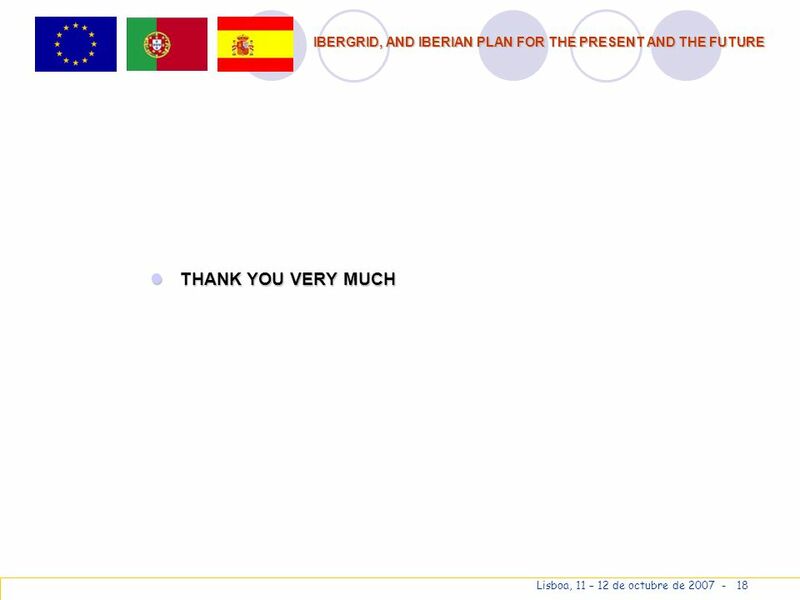 PRESENTATION WORKING.